Guitar Tex was opened in 1999 as primarily a repair shop and a place to sell some of my used instruments. As we are now in our 14th year much has changed but my focus has always been to get great playing instruments in the hands of players who will use them and enjoy them for years to come. We offer some of the finest instruments in the world but my concern has been for the player and his or her needs rather than for collectors. As I look around the shop today I’m proud and pleased at the way Guitar Tex has evolved. Back in the winter of 2000 Larrivee Guitars were the first maker that would even consider taking on a modest little fledgling start-up and I’ve been more than pleased with that decision. The next year we took on Weber mandolins, which was also an excellent decision. Since then our product line has expanded but our focus has never varied. Nearly every day we meet someone new who comments on what a cool shop we have. That makes me feel really good. Simply put, GUITAR TEX has the best selection of quality acoustic instruments in South Texas and a pretty fair selection of quality electrics. No one else comes close to the variety and overall quality that we offer at GUITAR TEX. MARTIN, LARRIVEE, REVEREND, HUSS & DALTON GUITARS, as well as KOALOHA UKULELES are all products carried by GUITAR TEX that can be enjoyed today and for generations to come. Please don’t call us a “boutique”. No need to use fancy French names to describe an old fashioned, locally owned guitar shop. John Michael Ramirez was playing in the hip local bands back when I was a kid in the mid 1960s and began working in music retail at Caldwell Music back in 1971. It’s safe to say that John nearly everyone who has played music in greater San Antonio knows John Michael. He was gone from the scene for a few years but we at Guitar Tex and the rest of San Antonio are glad he’s back. Myself, Mark Waldrop, owner of Guitar Tex, also played in area bands in the 1960s before moving to New York City in 1969 where I played at many iconic, if not always glamorous venues like the Cafe Au Go Go, The Gaslight Cafe, and twice at The Fillmore East. In 1994 I attended Bryan Galloup’s Guitar building & repair school in Michigan and I’ve been doing it ever since. Logan Mask also attended Galloup’s school a few years back, then worked with an experienced luthier. Now he handles much of the more in depth repairs that come our way. Logan has shown himself to be a more than able repair person. We’re also about professional repair and restoration of fretted instruments, so keep reading for the whole story. 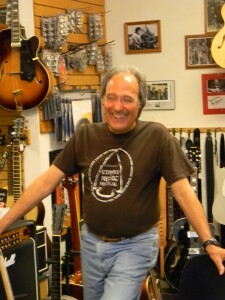 Guitar Tex is owned by Mark Waldrop who is a San Antonio native but spent a number of years in Greenwich Village beginning in early 1969 where he & his musical partner Bob Rountree quickly found work in the clubs & coffee houses like the Gaslight Cafe, The Village Gate, & The Cafe Au Go Go. On weekends when not gigging Mark would be found working at the Fillmore East. These experiences exposed him to a wide range of music & styles; in the West Village opening for the likes of Doc Watson & Ramblin’ Jack Elliot, & at The Fillmore East seeing some of rock music’s most famous performers at their peak. Hanging out in Matt Umanov’s music shop was a treat & was in some ways a later inspiration for what would eventually be Guitar Tex. Mark considers himself a “Musicianer” as defined by the street musicians for the the early 20th century, meaning a musician who plays all the music and styles that work; original songs, tunes from the lesser known writers, blues, jazz, country, bluegrass, swing, & pop. 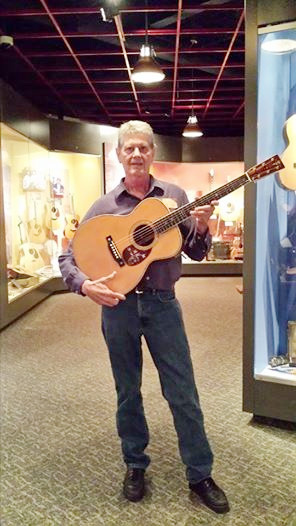 Mark attended Bryan Galloup’s guitar building & repair school in 1993, after moving back to San Antonio, realizing that the area was lacking in experienced guitar technicians. After honing his skills in the basement of 100 year old Alamo Music, and with $1,500.00, his tools & a handful of used instruments he set up his own shop in Olmos Park, with a vision of an intimate shop with a diverse and eclectic selection of merchandise. We’re celebrating 20 years in San Antonio & South Texas. Come by & see why we’re still around. Almost everyday we meet someone new or see a new & unusual intrument the likes of which we’ve never seen before. And even among jaded guitar nerds who’ve seen it all, we can usually show you something cool & exciting. At first glance we’re just a nice little guitar shop with some good guitars. Keep looking & you’ll find that we are also members of the community. We often know our clientele by name & what they like & don’t like in guitars, allowing us to truly be of assistance in locating just the right guitar for the right person. Come in & introduce yourself & let us get to know each other.